Today was a special day in my groundhopping odyssey in Warsaw. I got to visit the stadium of Gwardia Warszawa, a place I’ve wanted to see since I wrote an article about the club in January. 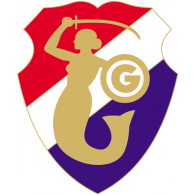 Gwardia (nicknamed the Harpagony – the harpies) is a very successful team by Warsaw standards, one of only four of the city’s clubs to have appeared in the Polish top league and one with a number of European appearances under its belt. 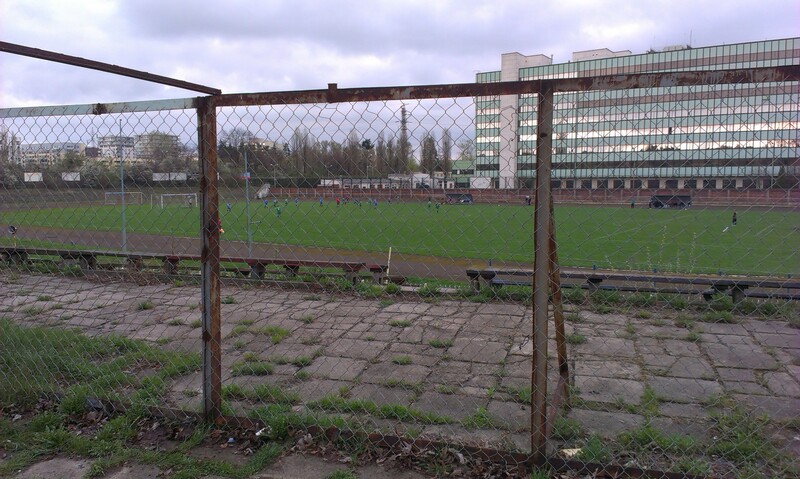 Now playing in the Polish 7th tier, the Klasa A, Gwardia possesses a gigantic, crumbling old stadium. In other words it’s a mecca for the Warsaw groundhopper interested in a bit of history. 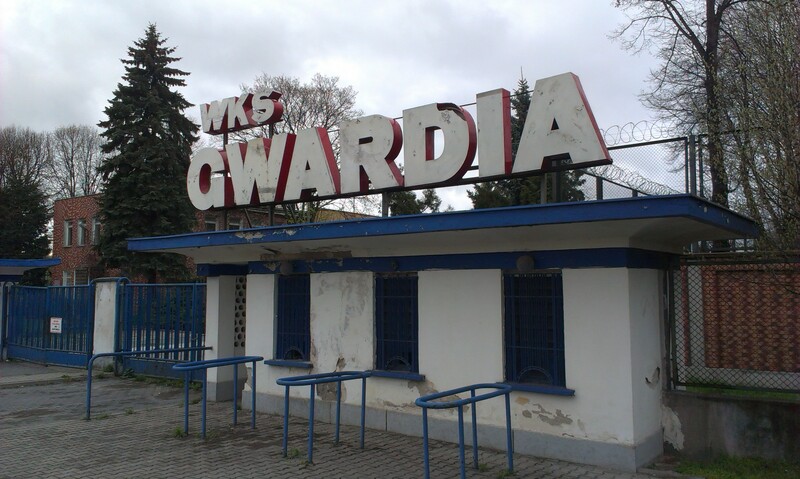 I had planned to go to a Gwardia game ever since the Polish lower leagues got back under way in March. 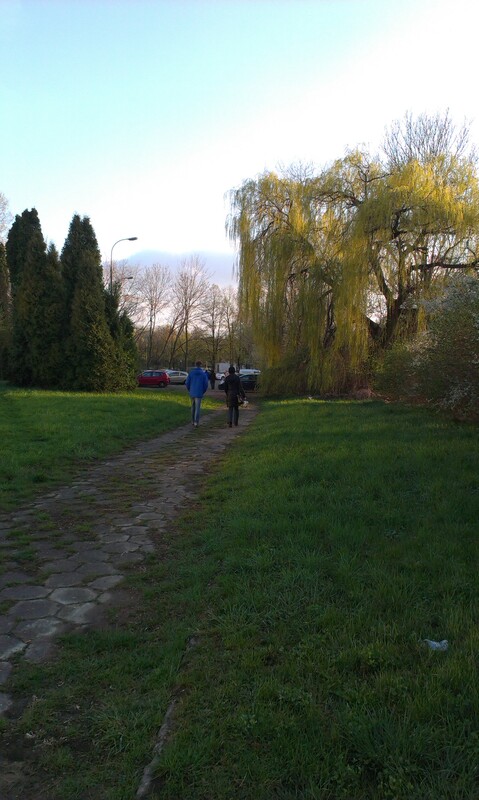 Unfortunately the long-lasting winter on the banks of the Vistula prevented Gwardia from playing at home until today. I thus resolved to get myself along to their match with Anprel Nowa Wieś, a team who sat third in the table before the weekend’s fixtures. Gwardia themselves sat in a mid-table 7th. In the previous meeting of the two sides, Anprel had hammered Gwardia 6-1, would the Harpagony be able to do better this time? In early afternoon I met up with some friends to watch my English team Reading confirm their relegation to the Championship. Whilst my mates got ready to see Arsenal-United I left the warm pub to find Gwardia’s ground. A combination of the metro and a tram got me to the stadium in the Warsaw area of Mokotów relatively easily, I now had to negotiate my way in. This was easier said than done. The main gates were locked, so I wandered round the perimeter looking for a gap. After a while of searching and growing irritation at the lack of an entrance I realised there was a way in through a side-entrance after all. I thus made my way through it and headed off towards the pitch. Unfortunately this was where the fun ended. 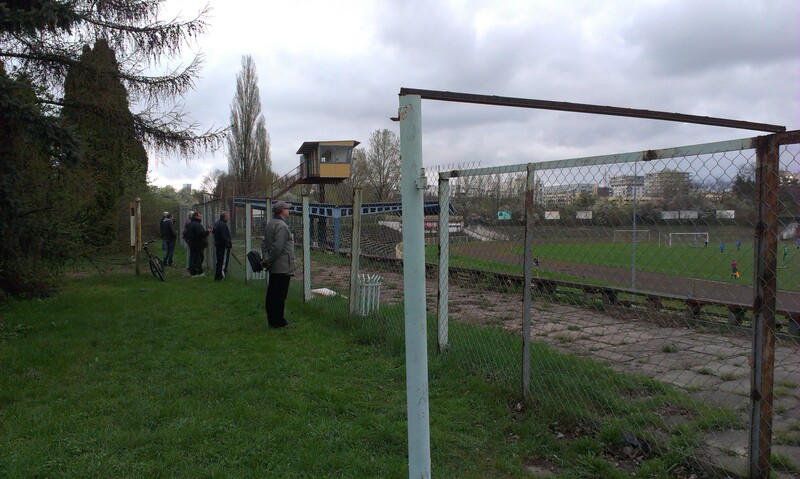 Since the summer Warsaw’s Main Police Headquarters, who own Gwardia’s stadium, have put up wire-netting around the stands as the club cannot afford to pay their rent. This meant the only way to watch the match was through a perimeter fence along with 20 or 30 or so other hardy fans. Frankly it was ridiculous that fans who wanted to watch their team had to do so in this fashion. Warning: No entrance to the stands! Despite the not-so-perfect view we did our best to absorb the match. It was a rather surreal experience, not just because of the fence but also due to the massive bowl of a stadium without anyone in it. The only sound came from the Gwardia and Anprel players, who filled the air with Polish swearwords. As to the game itself the first half was relatively even and ended 0-0. The second half was a lot better and was, in the main, dominated by the all-in-blue Harpagony. Ten minutes into the second half Gwardia’s industrious right-winger put in a good cross and their striker headed it into the net. 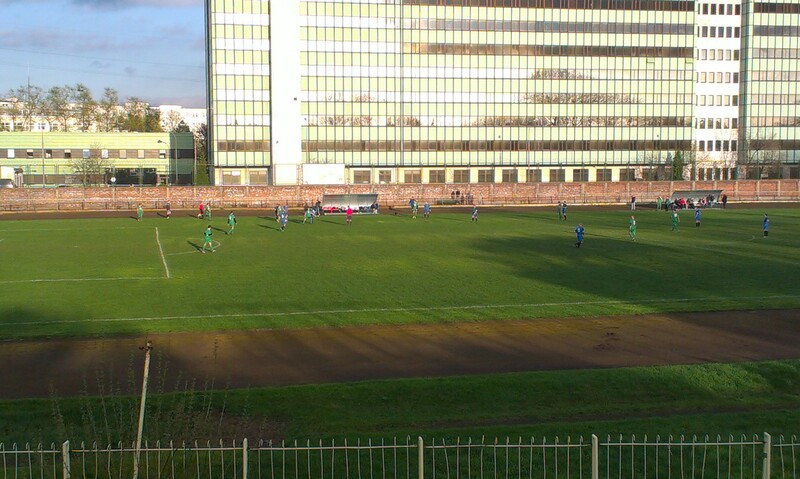 1-0 to Gwardia and they had a number of good chances to put the game out of Anprel’s reach. There were some nervy moments towards the end when Anprel had a decent penalty appeal turned down but Gwardia did enough to see out the win. So Gwardia came away with a good victory which keeps them in mid-table, 10 points off a promotion spot with 10 games to play. They were well worth the win and if they keep up this standard they still have an outside chance of advancing to the Liga Okręgowa (6th level). After the final whistle the several fans who were present set off for home in the late evening sunshine. It is to be hoped that some kind of understanding can be reached between the club and the stadium’s owners. It really is a sad sight to behold when people have to watch their beloved club through a massive perimeter fence. I wouldn’t wish that on anyone. Good luck to Gwardia in the future. This is rightbankwarsaw signing off. 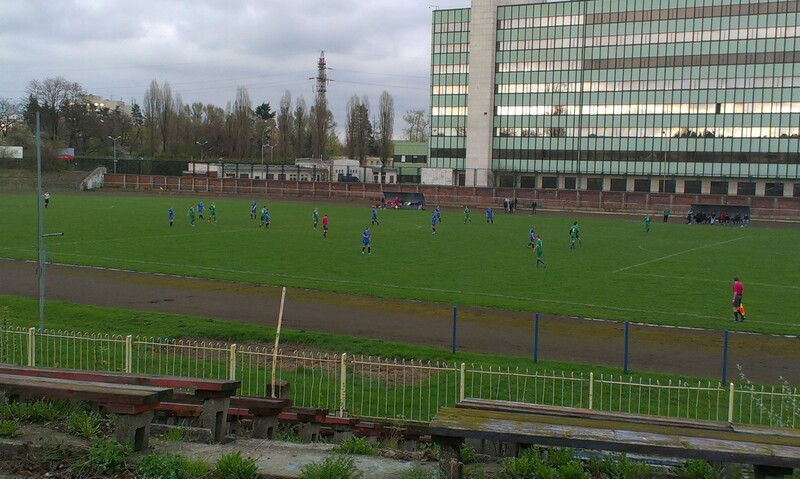 This entry was posted in Uncategorized and tagged Anprel Nowa Wieś, Groundhopping Poland, Gwardia Warszawa, Klasa A, Mokotów, Polish football, Warsaw. Bookmark the permalink.